The Learning Disabilities Association of Sudbury is pleased to announce the launch of our new Parent Education Program. Beginning January 16, 2019, the program will run twice a month (second and last week of each month on Wednesdays from January until May). 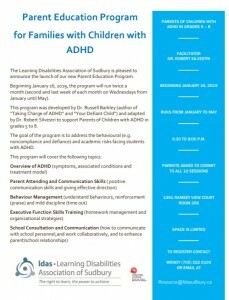 This program was developed by Dr. Russell Barkley (author of “Taking Charge of ADHD” and “Your Defiant Child”) and adapted by Dr. Robert Silvestri to support Parents of Children with ADHD in grades 5 to 8.